75 years ago, MAN Truck & Bus brought its first gas-powered bus to market, setting a new standard in doing so. MAN released the first gas-powered bus in 1943, which was first used in Nuremberg; the gas cylinders were fitted on the vehicle roof and the trailer. Now a new chapter of the success story begins with a brand-new development: the MAN E18 gas engine. 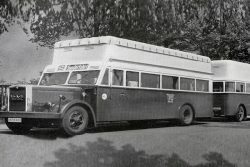 The first gas-powered MAN city bus celebrated its début in 1943. This year, the commercial vehicle manufacturer is bringing another newly developed gas engine to market: the MAN E1856 LOH. It will be exhibited for the first time at the IAA Commercial Vehicles in Hannover, Germany, in September. Then, as today, MAN broke new ground with its gas engine. The first gas-powered MAN bus was used for local public transport in Nuremberg. A trailer was attached to the vehicle, allowing it to increase its range considerably, as the gas cylinders were located on the bus and trailer roofs. “As a result, there was a cylinder volume of 22 m³, which made significantly longer routes and service times possible,” says Michael Kobriger, Head of Production Bus and the Bus Management Team at MAN Truck & Bus. MAN released the first gas-powered bus in 1943. “And there were special circumstances at play: MAN built the entire vehicle, which was specifically designed to be gas-powered. The expertise needed for this came from coach assembly work: “The employees had previously become well-acquainted with double-decker construction and built up extensive knowledge, for instance, from manufacturing double-decker bodies for chassis starting in 1935,” Kobriger explains. “MAN has been a market and technology leader in natural gas-powered buses in Europe for many years. We have applied our decades of expertise to develop a new gas engine, allowing us to keep offering customers cutting-edge technology as we move into the future. 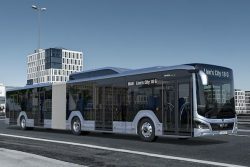 This rates highly for its exceptional cost-effectiveness and extremely low exhaust gas emissions, among other things,” notes Rudi Kuchta, Head of Bus Sales at MAN Truck & Bus. The MAN E1856 LOH delivers 320hp (235kW) and uses a four-speed automatic gearbox. In addition, it can be combined with MAN EfficientHybrid, making it even more economical to operate. As a result, along with biogas, the MAN Lion’s City G is the most cost-effective solution for virtually carbon-neutral local public transport, with the natural gas technology offering a huge advantage: outstanding carbon footprint outcomes for operators when vehicles are run on regeneratively or synthetically produced natural gas. “This is an important step forward into the future of MAN and many transport companies, especially when it comes to air quality control in urban areas,” Kuchta adds.